Rapid Fire and his three dragon friends Flying Spark, Silver Flash and Fire Trail are very excited as the flying competition through Dragon Valley is about to begin. But the flight to the big volcano is tricky. Now and again a treacherous whirlwind sweeps through the valley and forces the dragons to take a different path. They also need to keep an eye out for fire crystals on their path. It's not necessarily the fastest dragon who will win, but rather the one who has collected the most crystals. 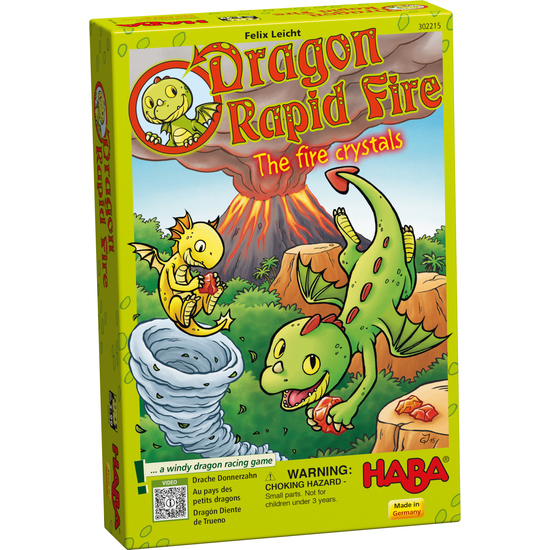 Contents: 1 game board, 1 green dragon, Rapid Fire, 1 yellow dragon, Flying Spark, 1 orange dragon, Fire Trail, 1 turquoise dragon, Silver Flash, 4 whirlwind tiles, 1 whirlwind dice, 60 fire crystals, 1 set of instructions.